Picture - Aichi D3A1 from carrier Akagi. Picture - Aichi D3A1 in flight. The Aichi D3A (Aichi-kyuu-kyuu-shiki-kanjou-bakugeki-ki), Allied reporting name "Val") was a World War II dive bomber produced by the Aichi company in Japan. It was the primary carrier-borne dive bomber in the Imperial Japanese Navy in the early stages of the war, and participated in almost all actions, including Pearl Harbor. The Aichi D3A was the first Japanese aircraft to bomb American targets in World War II. Before the war was over, it had sunk more Allied military ships than any other. The Aichi design started with low-mounted elliptical wings inspired by the Heinkel He 70 Blitz. It flew slowly enough that the drag from the landing gear was not a serious issue, so fixed gear were used for simplicity. The aircraft was to be powered by the 529 kW (710 hp) Nakajima Hikari 1 nine-cylinder radial engine. The first prototype was completed in December 1937, and flight trials began a month later. Initial tests were disappointing. The aircraft was underpowered and suffered from directional instability in wide turns, and in tighter turns, it tended to snap roll. The dive brakes vibrated heavily when extended at their design speed of 370 km/h (200 kn), and the Navy was already asking for a faster diving speed of 240 kn (440 km/h). Picture - Aichi D3A2 during maintenance. 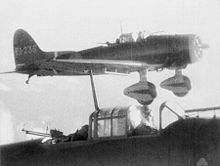 Picture - Aichi D3A from Shokaku return to their carrier after attacking the US carrier Enterprise during the Battle of the Eastern Solomons in August 1942. Armament was two forward-firing 7.7 mm (.303 in) Type 97 machine guns, and one flexible 7.7 mm (.303 in) Type 92 machine gun in the rear cockpit for defense. Normal bombload was a single 250 kg (550 lb) bomb carried under the fuselage, which was swung out under the propeller on release by a trapeze. Two additional 60 kg (130 lb) bombs could be carried on wing racks located under each wing outboard of the dive brakes. The D3A1 commenced carrier qualification trials aboard the Akagi and Kaga during 1940, while a small number of aircraft made their combat debut from land bases over China. Starting with the attack on Pearl Harbor, the D3A1 took part in all major Japanese carrier operations in the first 10 months of the war. They achieved fame during the Indian Ocean raid in April 1942 when the D3A1s scored with over 80% of their bombs during attacks on the British cruisers HMS Cornwall and Dorsetshire and the carrier HMS Hermes. In some cases, they were pressed into duty as fighters, their maneuverability being enough to allow them to survive in this role. In June 1942, an improved version of the D3A powered by a 969 kW (1,300 hp) Kinsei 54 was tested as the Model 12. The extra power reduced range, so the design was further modified with additional fuel tanks to bring the total tankage to 900 L (240 US gal, giving it the range needed to fight effectively over the Solomon Islands. Known to the Navy as the Model 22, it began to replace the Model 11 in front-line units in autumn 1942, and most Model 11s were then sent to training units. In 1945, Indonesian guerillas captured numerous ex-Japanese air bases. Several "Vals" were captured by Indonesian guerillas, including at Bugis Air Base in Malang (repatriated 18 September 1945). 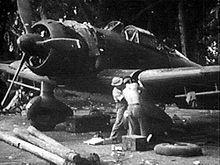 Most of the aircraft were destroyed during the Indonesian National Revolution in 1945-1949 when the former Dutch East Indies and the Netherlands were engaged in military conflict/police action in Indonesia. One D3A is currently under restoration at the Planes of Fame Museum in Chino, California. Picture - Aichi D3A2 with telescopic sight before take off. Fleischer, Seweryn and Zygmunt Szeremeta. Aichi D3A Val, Nakajima B5N Kate (in Polish). Warszawa, Poland: Wydawnictwo Militaria, 2001. ISBN 83-7219-118-2. Francillon, Ren� J. Japanese Aircraft of the Pacific War. London: Putnam & Company Ltd., 1970 (2nd edition 1979). ISBN 0-370-30251-6. "Pacific Predator... the Aichi Type 99". Air International, December 1987, Vol. 33, No. 6, pp. 285-290. Bromley, UK: Fine Scroll. ISSN 0306-5634. Aichi D3A Pictures and Aichi D3A for Sale.